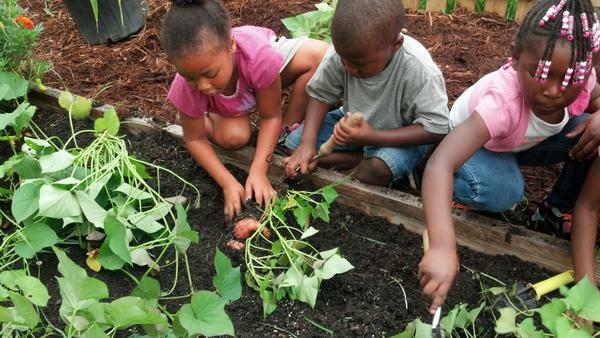 Early childhood educators can easily engage children in growing, harvesting, and preparing healthy, fresh fruits and vegetables at your center and at the same time provide numerous opportunities for hands-on learning. This publication shares information on easy-to-grow, child-friendly, warm-season fruits and vegetables suitable for a childcare production garden. For additional information, see other publications about Childcare Center Production Gardens in the Local Foods series: Growing and Cooking Fruits and Vegetables at Childcare Centers (LF-007-01) includes tips for engaging children of varying ages in gardening. Snacking and Cooking with Warm-Season Produce from Childcare Production Gardens (LF-007-05) includes simple recipes that can be used by childcare center cooks and educators to engage children in snacking and cooking with fresh, warm-season produce. Enjoying fruits and vegetables from their own gardening efforts can help children develop lifelong healthy eating habits. Happy gardening! 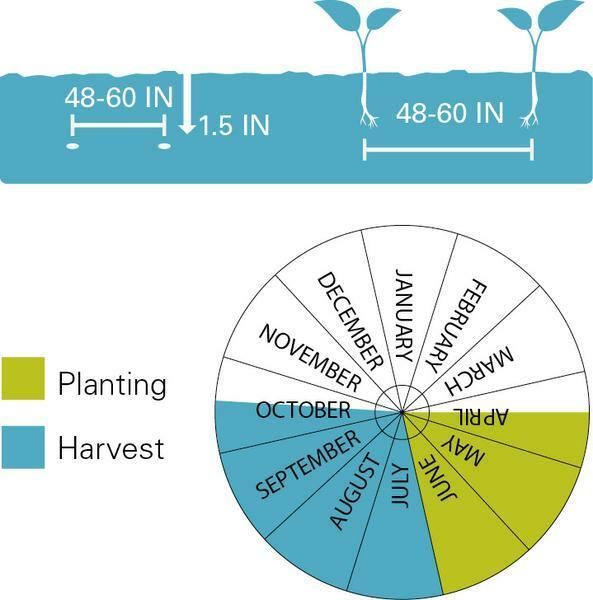 Note: Planting dates noted here are general guidelines and vary by region across North Carolina depending on the average date of last frost. Generally, the coast has an earlier planting date while in the mountains it is necessary to wait a little later for the first spring planting. Varying weather conditions can affect growing times as well. Contact your county Cooperative Extension center for guidance on planting dates, soil testing, and for plant varieties that perform well in your area. Direct seed: Seeds are planted directly in the soil. Transplants: Small plants (seedlings), usually started in a greenhouse, are planted in the soil. Each growing season mix 1 to 3 inches of good-quality compost into the garden beds before planting. Water every day after planting to establish plants. Continue watering every day or every other day as needed throughout the growing season. The crops listed in this publication are warm-season vegetables and fruits that perform well in North Carolina. Those at the beginning of the list are the easiest to grow. Those at the end of the list require more care. In a childcare setting, it is usually easier to start a garden with plants rather than seeds. Seeds are more affordable and provide an opportunity for children to follow the entire plant life cycle, but they require more attentive watering immediately after planting to be successful. Transplants purchased from a local nursery or home improvement store still require regular watering and attention, but are not as sensitive and are more likely to thrive. Raised beds with a mix of warm-season fruits and vegetables. Direct seed 1 inch deep and 3 to 6 inches apart in late May. Beans come in two forms: bush and pole. 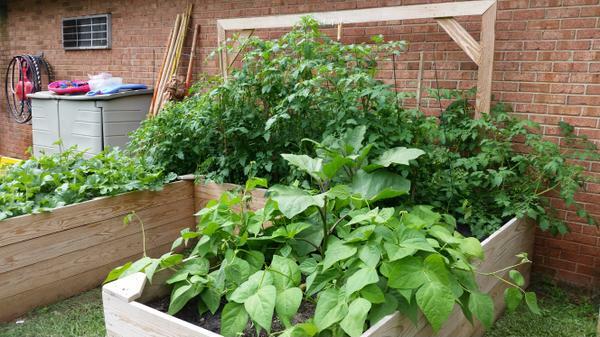 Bush beans stay relatively low to the ground (about 2 feet high and 2 feet wide) and do not need to be trellised. Pole beans form vines and need to be gently guided up a vertical growing structure, such as a bamboo teepee, trellis, or fence to support the plant. Beans can be planted in succession for a longer harvest. June to September. Harvest beans as soon as they are ready, when they are about 3 to 4 inches long and slightly rounded. Leaving beans on the plant longer results in tough, stringy pods with hard seeds in them. Pole beans growing on a well-anchored teepee make a fun play setting! Beans planting and harvest dates. Transplant 24 inches apart in late April to May with a staked cage around each plant for support. June to mid October. Allow tomatoes to ripen on the vine. They are ripe when they take on their final color. In North Carolina, growing tomato plants in Outdoor Learning Environments is allowed at licensed childcare centers for children three years of age or older. For more information refer to NC Division of Health and Human Services' Division of Child Development and Early Education. Smaller fruited varieties are less prone to splitting and make perfect bite-size snacks for children. Tomatoes planting and harvest dates. Transplant 18 to 24 inches apart in late May, and stake when they get top-heavy. July to mid October. All varieties start out green. Some stay green and others, depending on the variety, turn red, yellow, orange, or purple. Peppers are fully ripe and sweetest when they reach their final color. Pepper plants grow well in containers. Peppers planting and harvest dates. Direct seed about 1 inch deep. Place seeds or transplants 10 to 12 inches apart near a trellis structure or in 4-foot rows on the ground in May. Cucumbers are vigorous vines that will trail around the garden bed. To save space, gently guide vines to grow up a vertical structure, such as a trellis, fence, or cage. June to August. Harvest when cucumbers are at least 3 inches long and a dark-green color, before they have turned yellow. Cucumbers mature quickly, so be sure to check the plants every day. Frequent harvesting helps the plant continue to produce new cucumbers. Cucumbers grown up a teepee make a fun play setting for children. 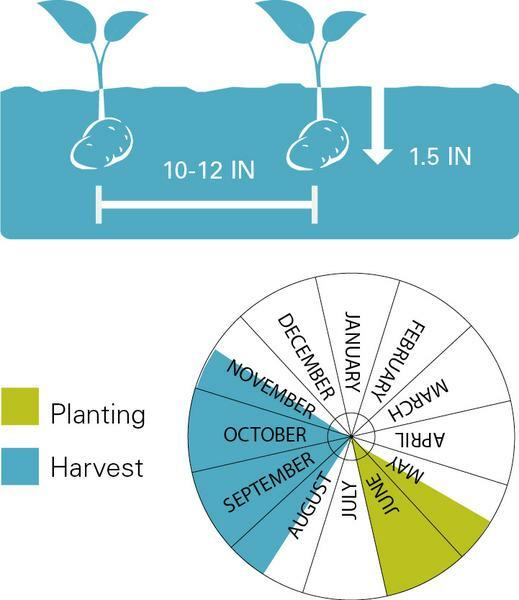 Cucumbers planting and harvest dates. Direct seed 11⁄2 inches deep. Place seeds or transplants 48 to 60 inches apart once the danger of frost has passed, mid April – June. July to early October. Harvest approximately three months after planting when the melon’s exterior begins to turn from green to tan. Place a board or piece of plastic under cantaloupes as they develop to prevent insects from boring into the fruit. One or two vines should provide plenty of fruit for a class! Vines need a lot of space and can spread up to 10 feet. Cantaloupes planting and harvest dates. Direct seed 11⁄2 inches deep. Place seeds or transplants 48 to 60 inches apart once the danger of frost has passed, mid April to June. Vines need a lot of space and can spread up to 10 feet. July to early October. Watermelons are ripe when the tendril closest to the fruit on the vine begins to dry out and turn brown and the underside of the melon turns a light yellow. Place a board or piece of plastic under watermelons as they develop to prevent insects from boring into the fruit. One or two vines should provide plenty of fruit for a class! 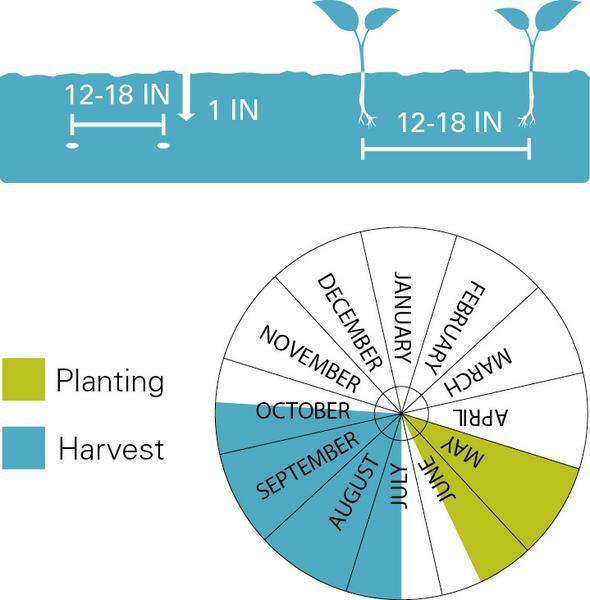 Watermelons planting and harvest dates. Direct seed 11⁄2 inches deep. 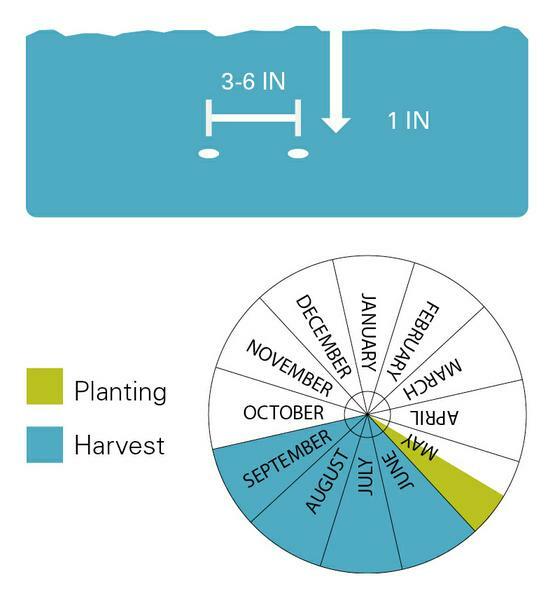 Place seeds or transplant 36 inches apart in May. June to August. Zucchini are most tender when picked at 4 to 8 inches long. Zucchini plants are very high-yielding and can be harvested every day during peak harvest time. Zucchini planting and harvest dates. 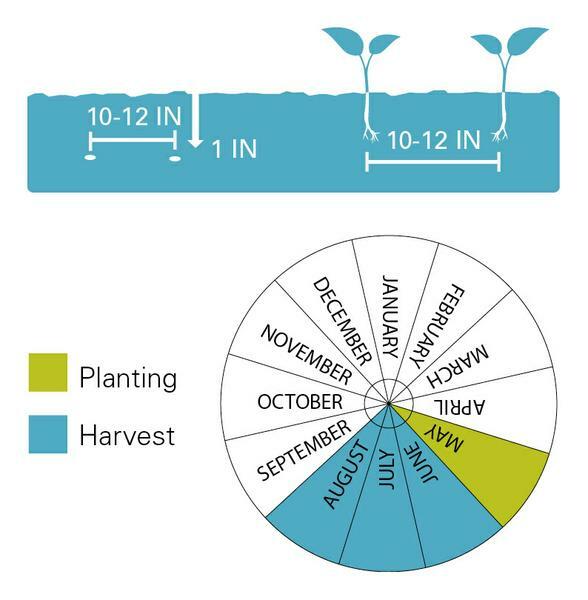 Planting: Direct seed 11⁄2 inches deep. 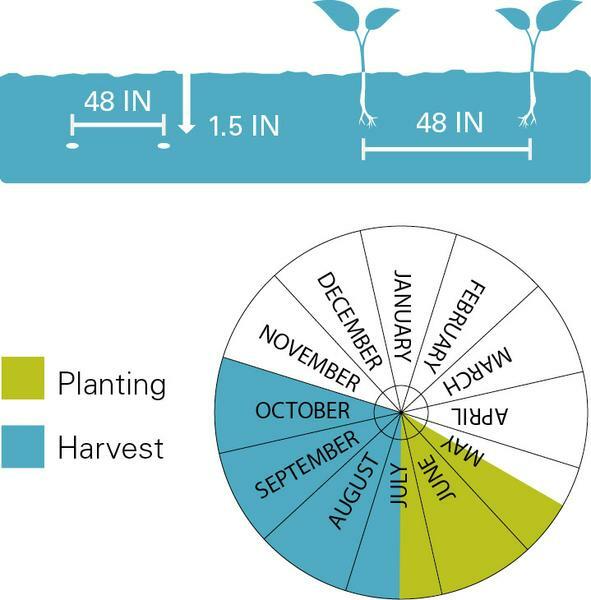 Place seeds or transplants 36 inches apart in May. June to August. Squash are most tender when picked at 5 to 6 inches long. Squash plants are very high-yielding and can be harvested every day during peak harvest time. Yellow squash planting and harvest dates. Direct seed 1 inch deep. 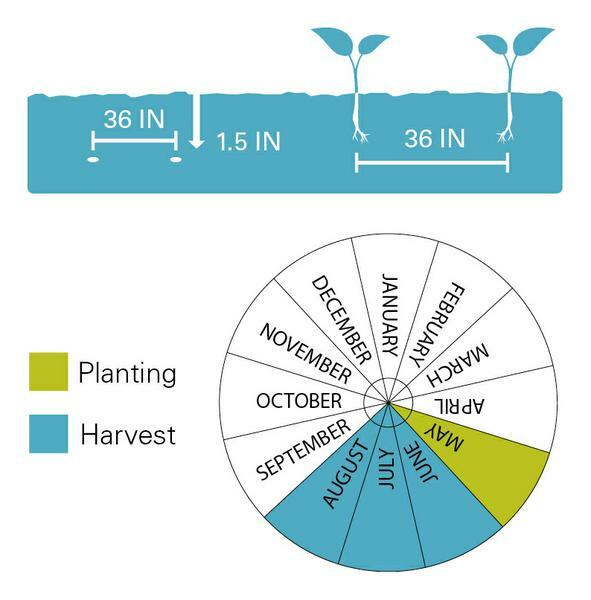 Place seeds or transplants 12 to 18 inches apart in May to early June. If direct seeding, soak seeds in water overnight before planting. Mid July to mid October when okra pods are 2 to 3 inches long. Okra plants grow very fast. Pods can go from the perfect size to overgrown overnight. Pods that get too large can be left on the plant to dry to become a fun rattle or musical instrument. Okra flowers are very beautiful and fun for children to explore. Okra planting and harvest dates. Sweet potatoes are started by planting “slips,” which are young sweet potato sprouts that have been grown from another sweet potato. They can also be purchased as plants at a nursery or home improvement store. Plant slips or transplants 10 to 12 inches apart in mid May to June in deep, loose soil or in containers. The plants are a vigorous vine and need room to spread. Late August to early November. Sweet potatoes are ready to harvest when the vines begin to die and turn brown. When harvesting sweet potatoes from containers, dump the contents of the containers into a wheelbarrow or onto a tarp and let the children have fun rummaging through the soil to find the sweet potatoes. 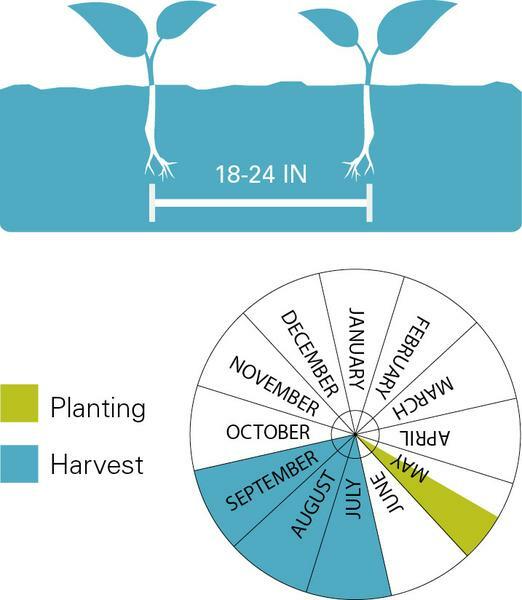 Sweet potatoes planting and harvest dates. Planting: Potatoes are started by planting potato “seeds,” which are pieces of potatoes that have sprouts on them called “eyes.” They can also be bought as small tubers. Plant to a depth of 5 inches in rows 10 to 12 inches apart in mid March to April in deep, loose soil or in containers or grow bags. “Hill up” or add soil on top of the potatoes as the leaves first emerge. Repeat as the leaves emerge again to create a “hill” or mound for the potatoes to grow in. Late June to July. Potatoes are ready after the plants have flowered and the vines have started to die back. If red, white, and blue varieties are grown, the tubers can be harvested in late June or early July, just in time to make patriotic red, white, and blue potato salad! 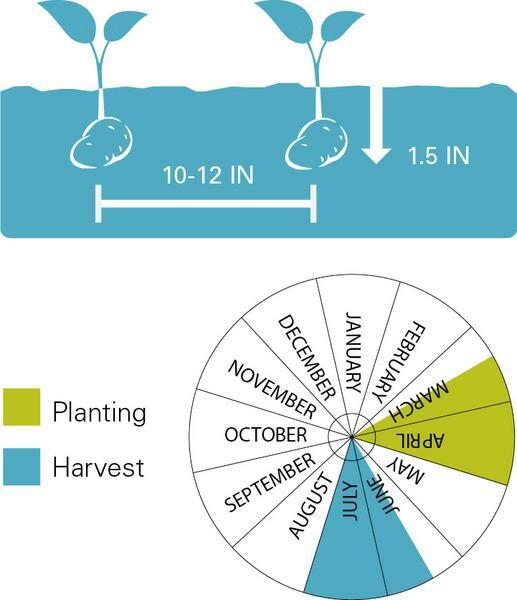 Potatoes planting and harvest dates. Direct seed 11⁄2 inches deep. Place seeds or transplants 48 inches apart in late May to early July. Plant later in the season for a late fall harvest around Halloween. July to October, when fruits are orange and firm. One vine of a smaller variety like Munchkin will produce around 14 pumpkins per vine, while a larger jack-o-lantern vine will produce around five pumpkins. 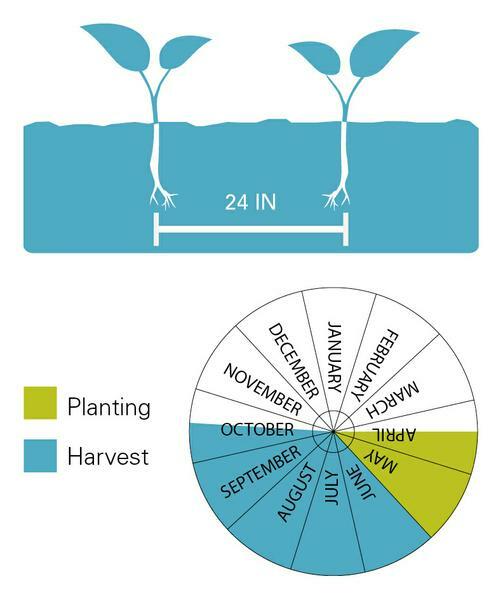 Pumpkins planting and harvest dates. Plant transplants 24 inches apart in late May to mid June. Stake when they get top-heavy. Mid July to mid October. Harvest when eggplants are shiny and firm, but not hard when squeezed gently. Over-ripe eggplants become dull, wrinkled, and spongy to the touch. Plants can be grown in large containers. Eggplant planting and harvest dates. The authors wish to express appreciation to Shawn Banks, Alison Duncan, Chris Gunter, Robert Jones, Debra Ireland, and Barbara Scott for their assistance in preparing this publication.